Your family ancestry is brought to life with this gift set. Within one custom frame [17”h x 29”w], your family name history is displayed with the coat-of-arms for your surname, hand-painted on premium parchment accented with an ornate gold foil design. 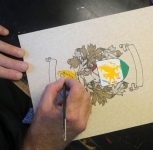 Gold foil accents shine on premium paper, as they support the shield displaying the authentic coat-of-arms for your family surname, painted by hand by a master artist.